Calling all poets, calling all Slam Poets, emergency Chch slam heats in one week, for national final in 10 days!!!! This year’s regional heat will be held at Tommy Chang’s Lyttelton 7pm Wednesday 6th November, competing for a spot in the national final to be held at Meow in Wellington on Sat the 9th Nov!! Poets must register by 7pm. Slam starts at 7.15 sharp. No props, time limit of 3 minutes or penalties will apply. Check NZ Slam website for exact rules, and details of the final. A maximum of 20 competitors on a first-in first-served basis. After a difficult and uncertain year the NZ Poetry Slam could not predict the ability to fully subsidize costs for competitors from Christchurch in the 2013 National Slam final, however, a last minute agreement has been reached by organisers to fully subsidize flights for 1st place, while holding a spot open for the 2nd place getter to be subsidized by proceeds from a $5 or more koha cover charge on the night. NZ Poetry Slam regrets the inconvenience late programming will cause for some competitors, and asks for the understanding and support of those unable to compete. NZ Poetry Slam is committed to resuming subsidy for the top three Chch slam poets in 2014. But the good news for those poets who can clear their schedule is … you have one week to prepare yourself for this last minute opportunity, the slam stakes have just been super-charged, you cannot afford to settle for third, only 1st and 2nd place travel to the NZ Slam Final. And hey, even if you can’t compete, come and enjoy, judge and help to get the winners up to Wellington so Christchurch has a voice in the national slam. We tried to secure a venue in town but all of our venues are in use so Tommy Chang’s (home of the Lyttelton Poets) has kindly opened their doors to this event. It will start early and we will endeavour to finish in time for the last bus at 11pm. Time starts when poet speaks, however while poets can have time to settle and adjust microphone etc, this time is not limitless; ideally a poet should start after 10 seconds. Random draw, for performance order. 'Sacrificial Poet' (non-competing) to start the night, to help calibrate scores. Slams are equally about writing, performance and audience response. 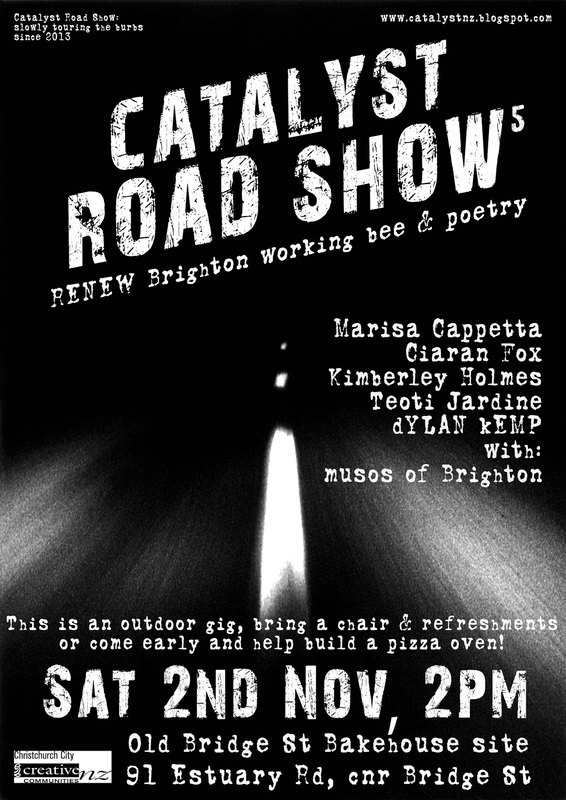 Catalyst Road Show 5: Working Bees! The world's slowest poetry tour trundles on! This time we're taking a fine selection of poets out into the daylight to imbibe a little bit of community spirit. Renew Brighton has instigated a working bee to build a community space with a pizza oven and some picnic tables at the site of the sadly missed Bridge St Bakehouse. We thought, what about combining a community effort with some performance poetry and music? Is this a new genre? Who cares? Everyone's welcome! Feel free to come along and muck in or bring some deck chairs and refreshments to enjoy the words and music. 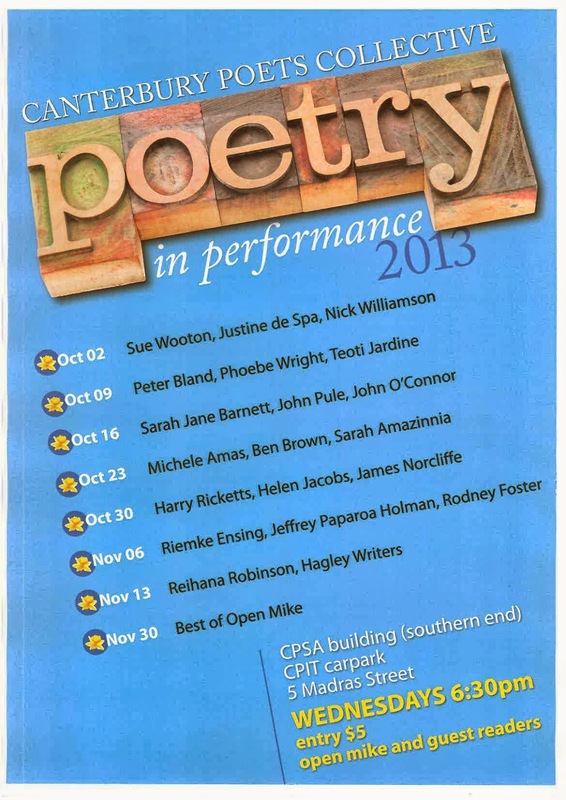 The working bee is kicking off at 10am and the poetry/music at 2pm. working bee start at 10am. Remember this is a empty site - bring your own chairs etc. wear sturdy footwear/weather-appropriate clothes and BYO refreshments. The gig is free - especially for those building and making stuff - everyone else we'll ask for koha. Poems in the Waiting Room is launching its 2014 Poetry Competition next week. 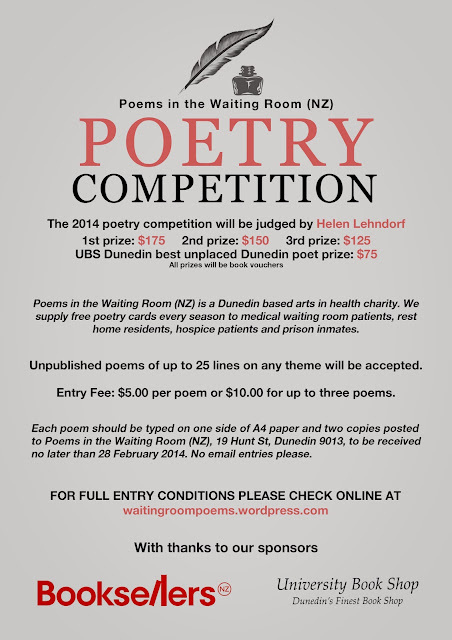 Poems in the Waiting Room (NZ) is a charitable arts in health trust which has been operating in New Zealand since 2008. Every season 6000 free poetry cards are distributed to medical waiting rooms, rest homes, hospices and prisons throughout the South Island and lower North Island. The cards may be read on site or taken home for further reading or sharing. Each seasons poems are also transcribed into Braille booklets which are distributed by the RNZFB. The competition has three aims; to provide a new selection of poems to use in the cards, to advertise the project, and to assist with the printing of future PitWR seasonal cards. Sue Wootton’s publications include three collections of poetry (Hourglass, Magnetic South and By Birdlight), a children’s book Cloudcatcher, and,most recently, the short story collection The Happiest Music on Earth (Rosa Mira Books 2013). Entries for the Caselberg Prize (First Prize $500) will be welcomed between 1st October and 31st December 2013. Several pieces of news to hand - we've been a bit slack in promoting this one but there are plenty of cool readings left this year. Get along and be part of the open mic and check out the featured poets. 20 November: Best of the 2013 season's open mic readers. Those Lyttelton poets are at it again, Andy Coyle, Helen Back, Ciaran Fox, Rebecca Nash and Ben Brown combine with guitar soundscaper Paul Timings for a night of sound and imagery. 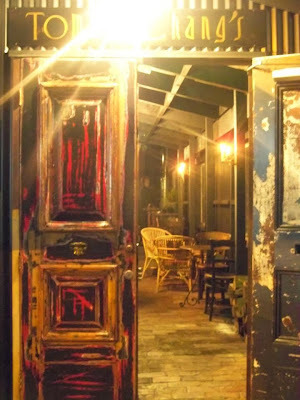 On a cold winters night at Tommy Chang's bar on London Street the Lyttelton Poets performed for the first time with Paul Timings, a singer guitarist with a wonderful sense of the atmospheric.